Fresh is an awesome chain of restaurants with locations throughout Toronto. Most of their menu items are vegetarian or vegan, and there are loads of paleo and low carb options available. Their servings are huge, so be sure to order the “baby bowls”, share with a friend, or ask them to pack up half of the meal before they serve it. One of our favourite Fresh recipes is the Green Goddess Bowl, a delicious combination of broccoli, bok-choy, kale, swiss chard, ginger, and sunflower seeds atop your choice of soba noodles, brown rice, or some super healthy low carb and high fibre homemade zucchini noodles. If you’re an avid meat-eater, you can substitute the tempeh for chicken, pork, or even beef, but if you haven’t tasted tempeh we highly recommend giving it a try! Servings: This recipe makes enough to serve approximately 3 people, or 1 person plus delicious leftovers! 6 cups cooked brown rice OR cooked soba noodles OR homemade zucchini noodles (just use julienned zuchinni’s (cut to look like noodles)- either raw or boiled in a bit of salt water for a few minutes until softened. Tahini sauce: Blend the garlic, parsley, salt and lemon juice in a food processor/ nutri blaster/ vita mixer/ blender. Add the water and sesame butter. Simple sauce: Put all ingredients in a saucepan and bring to a boil. Turn down, and let simmer for 10 minutes. Remove from heat. Tempeh/ Meat: Grill or fry tempeh or meat while you are making the simple sauce. Cut it into strips or slices. Steam broccoli and greens until they are tender and bright green. It may seem like you have a ton of greens when they’re raw, but they cook down quite a lot. Place your desired serving of rice or noodles in a bowl. Drizzle with 2 tbsp tahini sauce. Place nori on top. 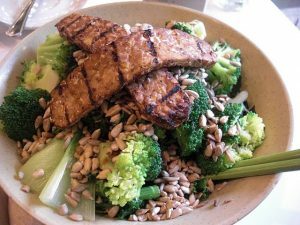 Arrange the cooked greens, broccoli and tempeh on the rice or soba noodles or zucchini noodles, and sprinkle toasted sunflower seeds on top. Drizzle with 2 tbsp of simple sauce.